Whaligoe Haven is surrounded on three sides by 250ft cliffs and forms one of the most remarkable harbors you will find anywhere in Scotland. 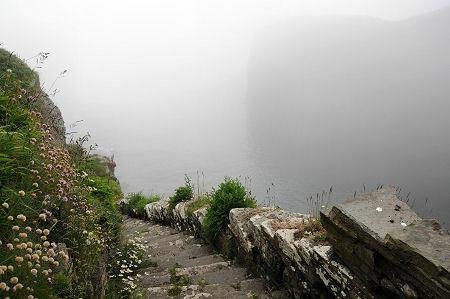 It is reached by the Whaligoe Steps, which descend to the harbor: and a trip down the steps and the hard slog back up them make for one of the most spectacular experiences in Caithness. 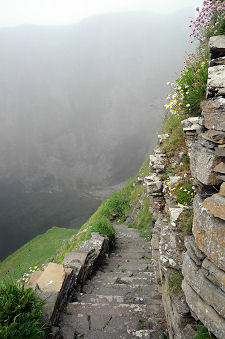 The Whaligoe Steps are made of flagstone and descend the cliff face in a series of zigzags. Local sources, including the account of those who look after the steps, all say that there are a total of 365 steps. The Royal Commission on the Ancient and Historical Monuments of Scotland, which we'd normally take as authoritative, says there are 330 steps. The steps are well graded and generally well maintained, but they are of stone and require great care if using them in the wet. 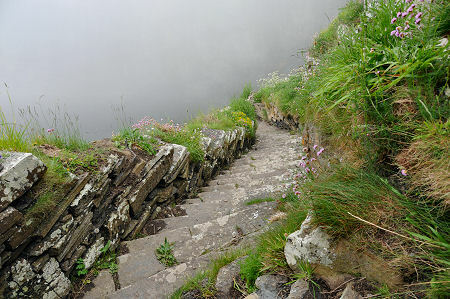 The descent into Whaligoe is a beautiful one, with wild flowers thickly coating the surroundings and seabirds everywhere. A head for heights is probably an asset: though in this respect descending in fog probably helps (if not in any other). Some people have certainly been deterred by the experience: the great engineer of the early 1800s, Thomas Telford, described Whaligoe as "a dreadful place." For most of the descent there is a low stone wall on the seawards side of the steps, though this disappears for the final flight down, and here you can begin to get a real sense of exposure. At the bottom of the steps is an artificial grassy area called the Bink, which is perhaps the size of a narrow tennis court. One end of this is home to the ruin of a building once used to store salt using in curing the fish. At the other end, more steps descend to a rocky shelf known as the Neist. A "goe" is a rocky inlet surrounded by cliffs, and Whaligoe seems to have been named after a dead whale that was washed ashore here. Harbors along this stretch of the Caithness coast are so scarce that local residents were forced to use Whaligoe as a fishing station, possibly from a very early date. Opinions differ about when the steps were built. Thomas Pennant, who visited in 1769, remarked on the use of steps by locals carrying heavy loads. 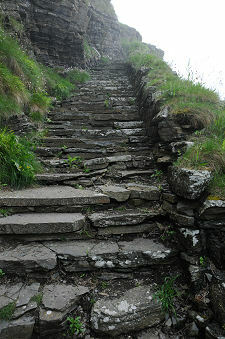 The current configuration of Whaligoe, and the full run of steps, probably date back to 1792. Until then ships using the haven had to moor against rocks on the northern side, while fishing boats were pulled up out of the water onto the Neist. This all changed with the construction of the Bink, which allowed schooners dropping off salt and other supplies and picking up barrels of cured fish, to moor much more easily. It also provided a much safer place to leave fishing boats after they had been hauled out of the haven itself. As well as the ruins of the salt store you can still see the barking kettle and fireplace on the Bink, where tar was heated for use in waterproofing nets and floats. Also on view are the rusting remains of a winch used for hauling fishing boats. By the mid 1800s there could be over 20 fishing boats using Whaligoe during the summer herring season, and schooners were regular visitors to the haven. The use of Whaligoe declined towards the end of the 1800s and by 1920 only five boats remained, fishing for salmon. By 1946 this had declined to two boats, and the last one ceased to fish from Whaligoe in the 1960s. The steps have since been maintained by enthusiastic local volunteers and it is thanks to them that we can still enjoy this amazing place.